For many living in hope is no more than living in a fantasy world where eventually good things always come out of bad things. Yet true Hope the hope out of which the impossible becomes possible is much more than just anticipating good things out of bad things. Hope is living life in the reality of the promised blessings of God yet to be realized. With Hope we do not anticipate God’s presence instead we celebrate and experience God’s presence in the NOW not an uncertain later date. Hope is one of the greatest gifts that come with a genuine relationship with Jesus it is a gift that must be planted and cultivated in the “fields of life” where it becomes life sustaining food for living in a world that hungers for peace. It is the Holy Spirit who plants and nurtures Hope bringing to life in us bible stories such as Hezekiah’s story in the Old Testament. Since 1981 I have had 14 major surgeries and any one of them could have ended my life but thanks to the medical profession and the Holy Spirit I lived through each one of them and because of those experiences and the bible when in the face of adversity I reflect back on them I do so in the reality that no matter what happens to me I live hand-in-hand, heart-in-heart with Jesus Christ. 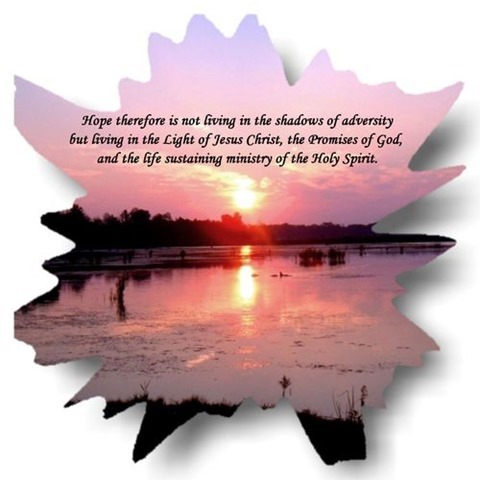 Hope therefore is not living in the shadows of adversity but living in the Light of Jesus Christ, the Promises of God, and the life sustaining ministry of the Holy Spirit. Scripture marked NKJV – Scripture taken from the New King James Version. Copyright 1979, 1980, 1982 by Thomas Nelson, Inc. Used by permission. All rights reserved.